Instruction: Hover over any red or blue icon to view detail. Click on any red or blue icon to "zoom in". 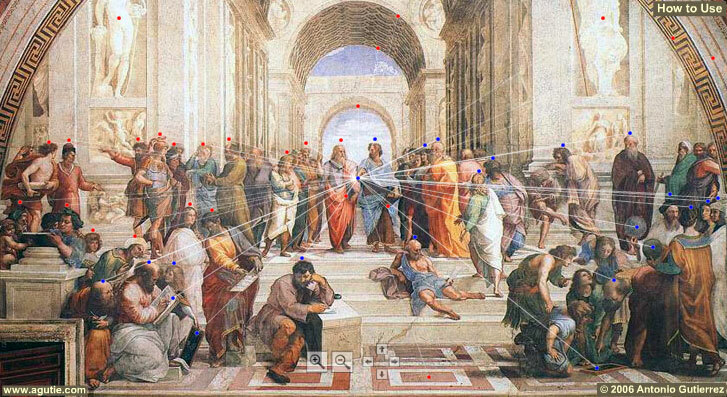 Use the Zoom (+ and -) and the Arrow buttons to move around the School of Athens. You can also "zoom in" a region on the map by click and drag a box with your mouse. Perspective: in art, any method employed to represent three-dimensional space on a flat surface or in relief sculpture. Vanishing Point: the point in linear perspective at which all imaginary lines of perspective converge. "The School of Athens, or Scuola di Atene in Italian, is one of the most famous frescoes by the Italian Renaissance artist Raphael. It was painted between 1509 and 1511 as a part of Raphael's commission to decorate the rooms now known as the Stanze di Raffaello, in the Apostolic Palace in the Vatican." Source: Wikipedia, The School of Athens.